I just read a life changing article. The author spoke passionately of her deepest desire to live a life that above all her made her happy. A life that not only provided for her financially but gave her the greatest reward of all, a happy and content soul. As my eyes made their way down the page, the words that appeared in front of me were as if they were being pulled from my own mind. She spoke of feeling trapped in a life that was slowly killing her soul. Playing corporate mind games, spending half my life sitting behind a desk and not contributing to the greater good of the world has always been difficult for me to accept. She recounted how she would numb the realisation of this with earphones and excessive amounts of coffee. This is me. My morning consists of exactly this, mixed with a regimental march to the beat of the corporate drum, racing the other rats to an end goal that only seems to get further away. Like most people, I have made endless excuses as to why I have not pursued what makes me truly happy. Feeling an obligation to look after those around me, a mortgage and the expectations of my loved ones and society itself have always prevented me from taking that leap into the great unknown. As the product of working class parents, I was raised to play it safe. Go to university, get a well-paying job and raise a family of my own. A sense of accepting periods of unhappiness in order to eventually become happy is a mantra I have unfortunately accepted as my reality. 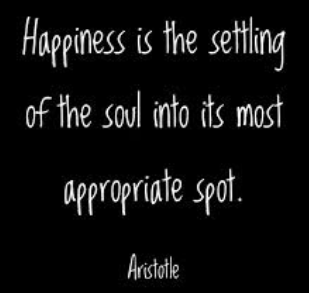 I have been so focused on these things that I have ignored what truly matters to me: happiness in the here and now. To spend my days doing something I am passionate about, something that encourages me to grow as a human being, is a notion I have only just managed to comprehend. I have accepted the fact that this may not be as financially rewarding as ignoring my desires, but what is the cost of happiness? The process of change is a slow, and at times, painful one. The author of the article told of her life changing moment coming at the age of 30… again, this is me. She put it perfectly when she said “You can’t steer a ship in the wrong direction for 30 years and then expect it to turn on a dime”. Advice I will remind myself of every morning. My true happiness is not going to arrive when I get that next pay rise or when my four weeks of annual leave arrive each year. Sure these things are nice to look forward to but for me, there has to be more to life than this. The time to start doing more for me, more of what truly nurtures my body and soul is now. Realising that this process is a slow one, involving one tiny step at a time, is a good starting point. While it may not reap financial rewards, investing in myself is the greatest investment I will ever make. As you get older, you realise that the age-old saying of “life passes you by in an instant” actually has some basis of truth. There is no guarantee that tomorrow will arrive. Everyday I ask myself if I would be happy if today was my last. Often the answer is no, but I am working on changing that.